perfect smaller size, Purchased 2 for main bath. Very high end look. Upgrade your bathroom decor with the KRAUS vessel sink and faucet combo. This set includes an elegant Elavo Ceramic sink with and Ramus Vessel faucet with matching Pop up drain. Dimensions 15.0 In. X 15.0 In. X 5.25 In. I ordered two of these to replace the sinks in our master bathroom. I also replaced the counter top at the same time with granite. I sent the make model and specifications to the fabricators to drill the necessary holes in the counter top and unfortunately the drain would not fit. Instead of sending it back I drilled out the holes, that was a lot of serious hard work! I recommend that if you buy this product and install in new granite counters, have your fabricator drill the drain hole double the size. Since this is a square top sitting sink (not a typical vessel) there is no need for such a tight fit. It will also make it easier in the future should you have to make plumbing repairs. Otherwise, these are great sinks/faucet combo. excellent value, exceptional quality with an updated classic look once installed. I fully recommend it if you are considering them. Plumber liked the faucet install, but had to add something so basin/drain didn't hold water. a bit of water always sat in sink until he fixed it. Looks very stylish, works very well. High end look without high end price. This sink and faucet duo is a great deal for the impact it presents. the sink was easy to install. Our fabricator cut the hole in the countertop for the sink drain slightly larger than instructions as per a previous raters suggestion and we had no difficulty leveling the sink. we purchased the faucet in chrome and it is beautiful. our plumber was surprised how much we paid for it and it too was easy to install. we also purchased the Sometiles Reflections Subway York stone and glass mosaic tile and they look wonderful together. We ordered 2 of these sinks for a large bathroom counter. They came in a timely manner. They were of a good quality. My plumber installed them quickly and easily. The faucets work beautifully. All of the parts were there and everything was in perfect condition. We actually ordered 2 other types of Kraus vessel sinks for our other bathrooms from Overstocks, and they were just as we had hoped as well. I would definitely recommend these vessel sinks to anyone looking for a sink other than your basic under counter mount sink. Great looking sink and faucet. Both were very easy to install! Good value for price. Sink is good quality and style. Faucet is average quality, but only has a 5-year warranty, compared to Lifetime for most brands. Time will tell on this. 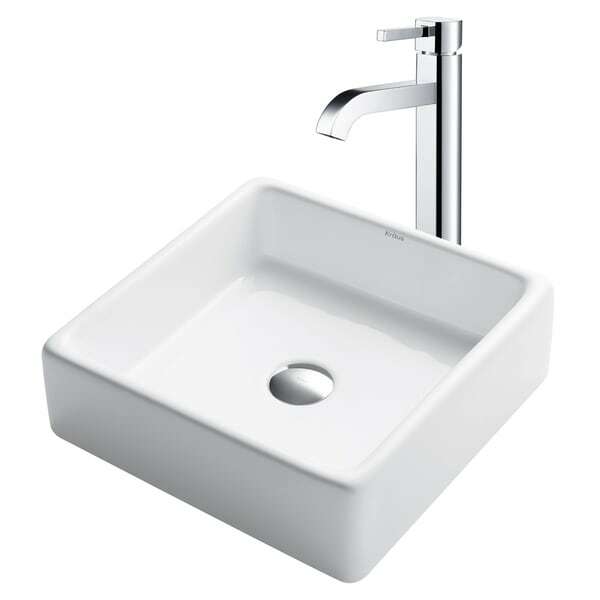 I usually buy Kohler or similar quality for faucets, but am trying Kraus as an experimental brand. It is for an upstairs bathroom so not as critical. I recommend reading industry reviews about Kraus and other brands - they mainly market products and outsource all manufacturing. Perfect size to fit a 36" vanity which I converted a dresser into a vanity. Going to use in our new home, in the mud room. We did not want a deep sink as we also have a utlility sink in the garage. If you are needing a deep sink, this is not the answer, but if you are looking for an unusual, fun small sink this is great. Haven't actually installed yet, but I can't wait to see it set up and use it. Great purchase. Exactly what I was looking for at great price. Ordered two for bath update. One had nylon washers missing for pop-up drain. Called Kraus number on invoice and had replacement washers in 3 days. Very satisfied with this purchase. This sink and faucet are the perfect solution for my bathroom remodel. The sink size is just right for daily use and the faucet's square stem is great with the square sink. Installation was easy. After years of plumbing fixtures in brushed stainless, it is exciting to rediscover polished chrome. The overall effect is rather neo-deco and quite dramatic in a neutral setting. Remodeled the powder room & wanted a different look. This Kraus sink is a big hit with my guests. The Ramus Faucet has a unique look & was a perfect match to the other metal accessories. I placed it on brown granite & it pops. Bought two of these for the master bath new vanity. Offset the faucets when installing to make it look more personalized and spacious. They are heavy duty and the faucet system was so easy to install. Pleased with the clean look and ease of installation. It looks beautiful! The sink and faucet look and feel very well made. I am so excited they are so nice. Just waiting on the granite installation before installing. Very happy with this purchase! I bought 2 of these and 2 lights for a guest bathroom update. Very good pourchase and great price for all 4 items + a few other accents from you! YEAH! The faucet is gorgeous I wish the sink corners were more square for the price you absolutely cannot beat this combo. Love mine. I bought two sets to install over granite and they added the extra height needed. Love them and great quality. "Does this sink/faucet combo come with a drain? I see one pictured but no mention is made of it." "Is this faucet available in a rubbed bronze finish?" "does this sink come in the color biscuit?" Homeowners with small bathrooms know firsthand how limiting they can be. A small bathroom might be perfectly functional, but a restrictive layout in any room can keep it from its true potential. Knocking down walls to remodel your whole space isn't always an option, so here are eight simple solutions that will help your small bathroom look bigger while sprucing up your current look. How to Remove a Bathroom Sink from Overstock.com. Our guides provide customers with information about how to remove bathroom sinks. How to Install Vessel Sinks from Overstock.com. Our guides provide customers with information about how to install vessel sinks.